Who Course is For: Fire fighters, law enforcement, rescue teams and professional rescuers. Technician Rope Rescue: Technician Level, Swiftwater Rescue Technician 1 and Swiftwater Rescue Technician Advanced. The Technical Rope Rescue Operations Level Classis a three-day intensive study into technical ropes. The class combines skills that will prepare rescuers to operate in low and mid rope environments through practical exercise. 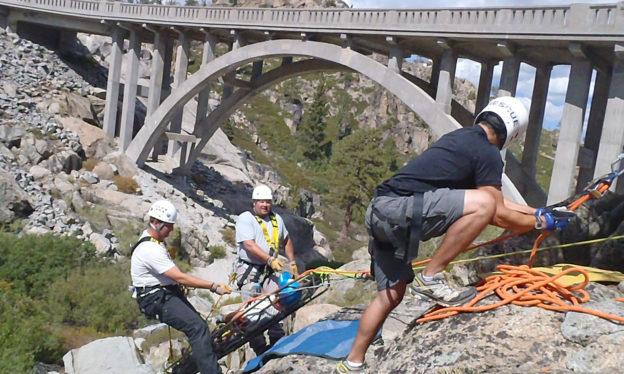 We believe in training rescuers who can not only build and operate rope systems, but also understand the forces, how they are applied, how to trouble-shoot a problem and how to assess and access subjects in a variety of situations. For vertical pick-offs, litter raises and high lines, please see our Technical Rope Rescue Technician Level classes. This technical rope rescue course meets the requirements for the National Fire Protection Agency (NFPA) 1670 standard at the Operations level for technical rope incidents. Many students in our technical rope rescue classes are rope rescue professionals, fire fighters, mountain guides and personnel aiming to become “Technician Level” responders. To become an NFPA technician in Rope, rescuers must complete the Technical Rope Rescue Technician Level course. No rope experience is needed to enroll in this class.